The gooseberries in this cake sink, so you don't really see them on the surface; it still looks good though. Wonderfully moist it goes well with cream whipped with elderflower cordial. Preheat the oven to 190°C/gas 5. Beat the butter and 125g sugar until pale and fluffy. Add the eggs a little at a time, beating well after each addition. If the mixture starts to curdle, add a tablespoon of flour. Fold in the rest of the flour, the almonds and the baking powder using a large metal spoon; scrape into a buttered, 20cm springform cake tin. Toss the gooseberries with the remaining 75g caster sugar and spread them over the top of the cake. Bake for 20–25 minutes. 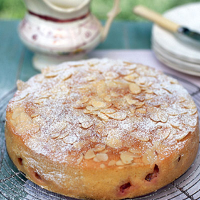 Sprinkle on the almonds and return to the oven for another 10 minutes. The cake is ready when a skewer inserted into its centre comes out clean. Leave it to cool in the tin, then carefully remove the ring and the base. Dust with icing sugar before serving. The sweetness in this cake is restrained enough to make a wine partner possible. A rich cream sherry is perfect.